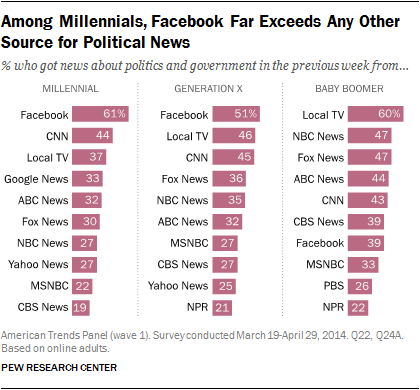 Among Millennials, Facebook is far and away the most common source for news about government and politics. When asked whether they got political and government news from each of 42 sources in the previous week (36 specific news outlets, local TV generally and 5 social networking sites), about six-in-ten Web-using Millennials (61%) reported getting political news on Facebook. That is 17 points higher than the next most consumed source for Millennials (CNN at 44%). Millennials’ reliance on Facebook for political news is also almost exactly on par with Baby Boomers’ reliance on local TV (60%). In fact, Baby Boomers and Millennials demonstrate nearly inverse habits when it comes to local TV and Facebook. Among Millennials, 61% got political news on Facebook and 37% from local TV. Among Baby Boomers, it’s 39% from Facebook and 60% from local TV. Gen Xers fall in the middle for both, with 51% getting political news on Facebook and 46% doing so from local TV. Millennials are also more reliant than other generations on Google News. A third (33%) get political news there, about twice the percentage of Baby Boomers (15%) and Gen Xers (18%). There is not, though, the same level of disparity when it comes to Yahoo News – perhaps tied in part to the early days of Yahoo as an email domain and portal; 27% of Millennials get political news from Yahoo, on par with Gen Xers (25%), but somewhat higher than Baby Boomers (21%). A source turned to at similar, and rather high rates across all three generations is CNN: 44% of Millennials got political news there in the past week as did 45% of Gen Xers and 43% of Baby Boomers. Beyond local TV, other sources Baby Boomers rely on at higher rates than both Millennials and Gen Xers include Fox News, MSNBC, CBS News, ABC News, NBC News, PBS, the Sean Hannity Show, the Rush Limbaugh Show and the Ed Schultz Show. 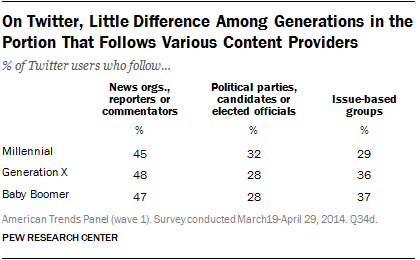 While these data do not speak to the amount of time spent with news, they do suggest that the sources for and the pathways to political news vary substantially across generations. 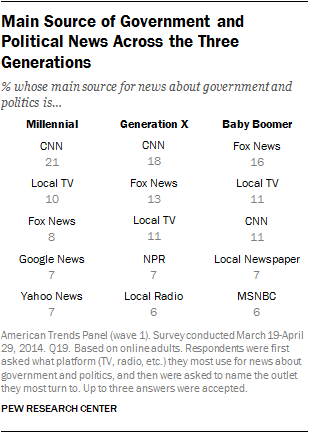 This sortable interactive provides the full breakdown of the rate at which each generation gets news about government and politics from each of the sources asked about. When asked separately to name their main source for news about government and politics (before being asked about the 42 specific sources), only a handful of sources garner double-digit percentages within each of the three generations. CNN, for example, is named most often by both online Millennials and Gen Xers at 21% and 18%, respectively; and among Baby Boomers, 16% name Fox News and 11% name CNN as their main source. About one-in-ten in each of these generations name local TV. All other sources are named by less than 10%. These findings also suggest the degree to which Facebook, even though it is by far the most common way Millennials get news about government and politics, is not top of mind as their main source for this type of news. Three percent of online Millennials volunteer Facebook when asked for their main source for political news (as do 1% of both Gen Xers and Baby Boomers. This is consistent with our previous research indicating that getting news on Facebook is largely an incidental experience. But even taking into account these differences, and looking just at Facebook users within each generation, Millennials are still somewhat more likely to see political content there. 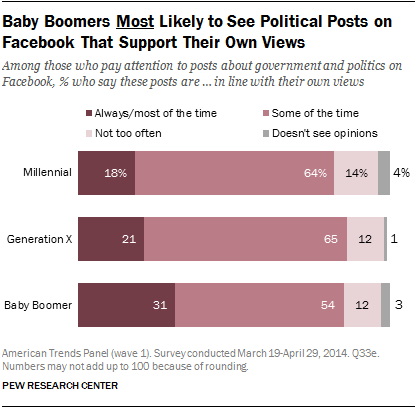 Nearly a quarter (24%) of Millennials who use Facebook say that at least half of the posts they see on the site are related to government and politics, higher than both Gen Xers (18%) and Baby Boomers (16%). 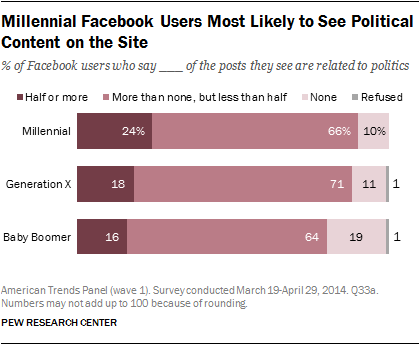 At the other end of the spectrum, just 10% of Facebook-using Millennials see no political posts, on par with Gen Xers (11%), but both lower than Baby Boomers (19%). What’s more, both Millennial and Gen X Facebook users are more likely than Baby Boomers to follow news organizations via the social networking site, although there is no real difference in the portion of each generation’s Facebook users that follow political parties or candidates, or issue-based groups. Across all three generations, Twitter is a far less common source for political news than Facebook; 14% of online Millennials got political news on Twitter in the past week, slightly higher than both Gen Xers (9%) and Baby Boomers (5%). 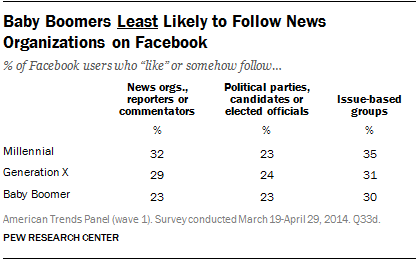 But, there is no indication of difference in the portion of users across generations who follow news organizations, political parties or issues groups: Close to half of those on Twitter in each generation follow news organizations or reporters, about three-in-ten follow candidates or parties, and between 29% and 37% follow issue-based groups. When it comes to tweets users see, Baby Boomers are more likely than Gen Xers to say that at least half of them are related to politics (32% vs. 20%), but are on par with Millennials (24%). But users across the three generations are equally likely to say that none of the tweets they see are related to politics (24% Millennials, 21% Gen Xers and 21% Baby Boomers).